If you had to describe most video game carrying accessories in one word, it would probably be something like minimal. Boring. Tacky. Cheap. Puffy. And it would usually look like something you'd buy for $10 that looks like it cost $0.50 to make. 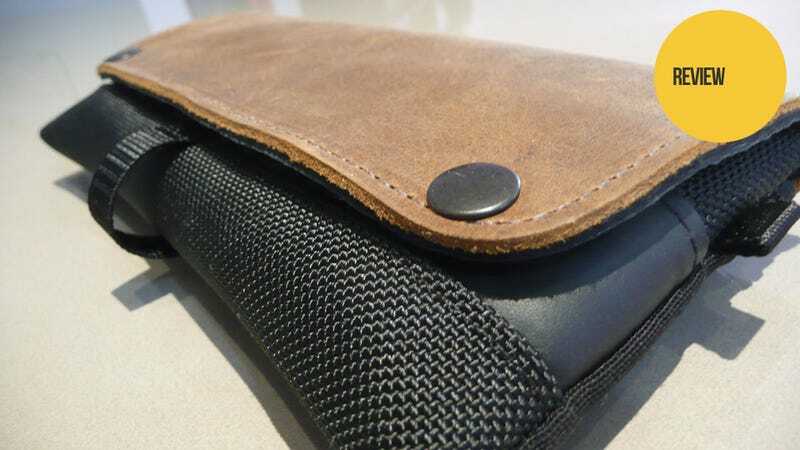 Which is why I like Waterfield's new PlayStation Vita case so much. Because the word I'd use to describe it is manly. Take the thing out of its box and the first thing that hits you is the smell. That pungent aroma of real, serious leather. It's the smell you get when you walk into a store that sells cowboy boots. It reminds you not of cheap Chinese console accessories, but of men who would wrap important things in leather then sling them over horseback and go shoot people. I like that. I didn't have a horse to take that testing analogy all the way, but in my week with the Waterfield case I did just about everything else with it. I threw the case, I dropped it, I tossed it into a bag with my football boots, I let my kid do her best to destroy it with her destructive little fingers, and by the end not only was my Vita fine, but the case was completely undamaged as well. Best of all, it still smelt like cowboy boots. The case is built of three parts. There's the super-sturdy leather flap that serves as a front/lid to the thing. The body is comprised of a rough material Waterfield said was "ballistic nylon" (ie used in bullet-proof vests), while the interior has a soft lining. It's also got three main compartments, the main case for the Vita itself, a large pouch on the back that's big enough for a USB cable (though not the AC power adapter) and, inside the lid, five small pockets for game cartridges. These pouches are about the only bad thing I have to say about the case. The "ballistic nylon" is incredibly rough, with "windows" in the pockets small. You're left then with a choice of exposing the game card's sensitive rear chip to the scratchy texture as you slide them in and out, or resting them against the softer leather front but being unable to see which game you're reaching for. Everything else, though, was great. The Vita fits snugly, it's safe from harm and best of all the case makes you think you're carrying around something more serious, like a giant Leatherman, or a pouch of dirty pipe tobacco. They retail for $49, and are available on Waterfield's website.